Love the music, it reminds me of growing up in Singapore where we had a radio program called to 'To Each his Own" and the music is so very similar, the music played now were bit hits at that time. Please keep it up as my heart sings when I hear the music. I am listening via my laptop as I tune in most days from about 12.00 pm til about 6 pm Monday to Friday along with Tuesday mornings when I can as I enjoy the music as you do have some very good presenters. I do know a few of presenters there. I am writing this on a beautiful Sunday morning and would like to share a kind word of appreciation for all the enjoyment Capital gives me. I listen to Capital over most of the day, every day. Life would be very barren without the good company of the presenters, and the stimulation of "real" music from the 1950's and 60's. I belong to a discussion group hosted by a senior's organisation and some of the topics are: generosity, volunteering, social isolation, the ageing process, depression, gratitude, optimism. This group brings out the best in others; some recurring themes are we all need other people in our lives, along with variety and stimulation. I would like to let the volunteers at Capital know that you are on the same page, that your contribution is spot on, and that I personally appreciate all you do. Thank you. This is my absolute favourite radio station. Thank you for transporting me back to my younger days. Loving the music ! Was driving home, started listening to the music and decided to just pull over in a car park to enjoy the rest of your program as don' t normally listen to the radio at home .. thank you kindly for the music! Capital Radio, don't underestimate your audience - you might be for seniors but the kids and I listen in the car because I know that they won't hear crass language or ideas on your station. Plus the music is good. Love, a thirty something year old. Thanks for the great choice of music for this afternoon's programme, Tuesday 5th June. I am not a very senior listener however I enjoy many of the programmes I hear on capital. Hi, my name is Denisa and I just recently discovered your show on the radio and I just have to say I am absolutely IN LOVE with the music that you play. Even though I am a 1993 kid, I feel so much nostalgia listening to all the music played. I listen to it every time I drive now, I don' t even bother turning on my own music playlist. I hope you are able to release a list of the songs played so I can listen to them more! Thank you, and keep up the great work!! Have been enjoying the music. Excellent selection. Lovely to hear Edward Woodward on swinging down the lane Thursday mornings! I have been a listener to Capital Radio since you started up. Before that I used to listen to the presenters at a previous station. I would like to say how much I enjoyed the acknowledgement of Easter over the long weekend. It was lovely that each presenter played a selection of songs acknowledging the Christian meaning of Easter. Thank you to everyone at the station. Your time and effort are very much appreciated. Just found you on the internet. Good tunes. Best regards. we listen here in England on Sunday mornings (your time between 3 and 5 am) and thoroughly enjoy the music and the community notices, sometimes I wish I was there to go to some of the events. Keep up the great music and banter. What a wonderful afternoon of music very enjoyable will keep radio on for cruising show. Thank you really glad I found this radio station. Enjoying current music. I was a lad of 15 from kalgoorlie boarding away from home in 1958. Used to listen to the american hit parade on 6 i x on sundays. These tunes are with me forever. Many thanks. I love the music you play - especially the early morning programme....I've put lots of ,y friends onto you and they're enjoying the mix as well...well done! My husband and I both enjoy the music presented each and every day and our radios are always tuned to your station. We do telephone and express our appreciation to the various presenters, but on this occasion I wanted to say how much we enjoy the programme presented by Terry Spence. Thank you. Just want to say a HUGE thank you to Capital Radio especially Peter Solomon and Roz (Sunday Jazz and Swing) and the sponser Mellen Events of course, for allowing us to win 2 tickets for the amazing concert JAZZ on a Summers Day. What a wonderful prize, I love the Kings Park venue its such a lovely way to enjoy good music. Thank you once again! And of course thank you for the wonderful music played by all of your presenters just Great! Dear Friends: ThankB4s for the good music! My wife and I have been visiting family in Perth for 27 years...and also to listen to your MARVELOUS capital 101.7. We enjoy your programme very much. Although we thoroughly enjoy the music content of your radio station, the reading of the news is often poorly done. Today, Monday, the 10am news was read so quickly, it was gabbled, and virtually unintelligible. Very often, the pronunciation of words is poor, and I wonder how the newsreaders are chosen, and what training they are given. If they are hoping to gain employment in the media industry, they should be assisted and given appropriate training or they will be sadly disappointed. This is in no way a criticism of the individuals, but a plea to improve their diction, and delivery of news. Perhaps your excellent programme announcers could share their skills? I was one of the recipients of Marco Fussy Meats cooked ham at Christmas. I am sure you are aware of this butcher and the gorgeous different meats they sell but wanted to thank the station for the opportunity to win such produce during the festive season and reaffirm the calibre of this sponsor. My friends and I enjoyed the ham so much to the extent we have revisited the Butcher. Cheers & keep up the great work. Really enjoy your broadcasts my station never changes. Especially enjoyed this mornings music (12/01/2018). So nice to go down memory lane with you all. Just tuned in at 6pm Tuesday WA for cocktail music. Fabulous. Could only do an hour this week but will be back for the full monty next time. Very good choice, appropriate and fun. I really enjoyed the song Santa Lucia that played just now . (about 11:30am 9/1/2018 ) Thank you so much! To Geoff Smith - Athletics WA write to thank you for the excellent coverage and promotion you provide to our sport every Saturday morning. Just want to say how much I am enjoying the lovely Christmas programme playing over the airwaves at this time. From the first song sung by Julie Andrews, I knew I was in for a treat!!! I have been wrapping Christmas presents and thoroughly enjoying listening to the variety of music and loving all the newsy and sentimental comments about Christmases past.I love community radio and have to say that I have heard the most Christmas songs and carols on your station and it makes a refreshing change. I listen via internet connected radio without going thru a PC.I'm not old but I like the 50's music.Would like to see more on fri and sat nights starting at 6.00pm with Neville.The other station appears to be losing listeners playing stuff which is already on a number of stations. I've adored every minute of the brilliantly chosen music this morning. What wonderful taste! Loving your music. Shame you don't have someone at the end of the line. I'm a Curtin radio listener . I love your programs and at the moment we are listening to Sat arvo Jazz !! The problem I have is that I can't get you on my car radio on FM?? Why is that? Do I need a digital radio in my car as well ?? Thank you for the oldies music ! Coming from germany 63 years ago : Vienna, German and Berlin operetta etc. Thank you for your lovely program! I enjoy your wide range of music. I particularly like the Saturday sporting breakfast and music shows. Was visiting my son & family in Fremantle when I first heard your radio program (which my son has on every day) JUST LOVED it and am so pleased to be able to get it online - Thanks for a GREAT station!!! Capital Events is a good idea but needs to be developed. More people to support Tony Howes. eg mature theatre reviewers, mature movie reviewers, TV reviewers etc. Love listening to you in the morning on the drive to work. Keeps my toes bopping. You have some real gems, you don't hear anything like it anywhere else. Sydney radio is no where near as good as this. I have not found another golden oldies station online or locally as diverse in the selection as Capital. I love hearing the presenters personal music collections. They are such rarities. I am 38 years old, and smile and feel like there's an elderly friend with me in the office while I work. Thank you for your hard work, and please don't change. We like the current format which gives variety while remaining true to "The Golden Years". We have listened on-line in Albany, Sydney, Singapore, Malaysia and others and no-one else does it like Capital!...Great service to the older generation. I enjoy most of the programmes and their wide ranging selection of music. Thanks to all the volunteers for keeping us entertained with great music! Thanks for providing music and ambience that's less frenetic than some, but still fun ?? We have been avid listeners for exactly 1 year now & absolutely LOVE it. The TV doesn't get used half as much as it used to. Well done everyone - keep up the good work. The radio station is excellent with really nice easy going songs that we don't hear often. love capital radio , I grew up alongside wireless hill, BUT you play toooo much really old music from 20s 30s , the people of that era are long gone !! I came across to Capitol during Feb/Mar whilst at home recuperating from fractured femur would now listen to Capitol 75-80% ABC the rest a wonderful radio station who play great music and enjoy the presenters who are obviously passionate and dedicated to the station. Great programmes, particularly love tues /thurs classical and sunday jazz and michaela on Sat. Would love more country music in its own session. Thank you! Love your radio, keep the excellent work - so good to hear great music along with interesting info about the artists. Also, like the flow, commercial stations so full of so much advertising and awful presenters, they aren't funny - they're annoying and can be quite rude. Your presenters are a delight and advertising for local community organisations is great. Well done ! Love your music variety! Makes such a nice change from the commercial stations! I enjoying the music selections; the variety is superb. Capital is a great radio station. Congratulations to all of your volunteers who are obviously passionate about the music they play. A variety of presenters with varying musical tastes makes for entertaining radio. We are so fortunate to have Capital in Perth. Congratulations to all the presenters, and the producers the technictions and those patient operators on the phone. You bring a massive amount of pleasure to thousands of listeners. I found your station while staying in Perth, visiting our son. Melbourne has lost its stations playing e.g.Matt Monroe, Frank Sinatra, Dionne Warwick - good singers of tuneful songs. A great radio station for us "Seniors" that has something for everyone. Came accross your station on Radio Garden. Really enjoy the oldies. Fabulous music, I don't listen to any other station. I'm 27 and I really love all the older music. Keep up the good work! Sat early afternoon presenter's jazz is fantastic, but sadly his voice inflection is forced and a bit weird. The S. African Roger? is overly precise in his pronunciation. These are simple irritations along with too many ads for hearing aid technology. A wider range of ads please. We are not all inclined to plan our funeral just yet ! love the station, and looking forward to the next serial! I started listening to your station when I found it a couple of months ago for my 92 year old mother (who has mild dementia ). Finding your station has revolutionized our life, as my Mum loves the music you play and I enjoy listening to music and songs I haven't heard for years as well. When Mum stays with me the radio is tuned to your station most of the day! Thank you. Please - keep talking to a MINIMUM. please - No Serials. There is too much chatting, Rock and Roll and Jazz for me and not enough "Golden Years of Radio" or Light Classical. But I love it otherwise. I'm not a big jazz fan, but don't mind the 'big band sounds' with the singers, especially the lady singers in the 'easy' style. 50s and 60s is my era when I was a teenager. I'm just 70yrs now. I love the radio station but wish they did an omnibus edition of the serial. I have been away for a week in Melbourne and missed the end of the serial. I am devastated.!! Have just discovered Capital Radio and love it! It has introduced me to a whole new era of music beyond the pop tunes I grew up with (I'm 41). Love the unpretentious presenters. Live and listen in UK, but visit Perth twice a year so survey not really set out for me. Love the music and presentation. favourite prog is Sat 12:00 to 15:00.
great music,diverse selection,great artist knowledge and detail.Perhaps more folk ,bluegrass,& Celtic sessions? My Granddad introduced me to this station and I have been listening for at least 3 years now. I'm 22 and love every second, especially the presenters. Thank you Dale for great breakfast show this day Friday 18.11.16. Announcers commentaries on the artists of those days and other features of the particular era are very much appreciated. Very pleasant accident discovering your station today whilst in Perth for the day, reception came and went as far as Eneabba traveling back to Geraldton. I listened till there was nothing but a hiss. Any chance you could broadcast through Geraldton? Your station would be a hit here.Absolutely love it already, thank you. You guys have improved tremendously since I first discovered you some years back. Not only announcing, but you have managed to tame Conrad! We enjoy Graham on Tuesday , rich voice, good music selection. Have been listening 24/7 for past six years. Don't know what life would be like without you. I really enjoy listening to this station. There is a very good selection of (old) jazz music. Hi I'm 17 and I love this radio station. It's not exclusive to the older generations it is inclusive to all people who love golden era music. Thanks so much for running this service. Thanks for the memories, you have been the soundtrack of our summer and winter! Doing a good job on the whole. Greetings from northern California! Really enjoy Capital Community Radio; your music is a lovely mix, and it's a thrill to be "time-traveling to tomorrow" while I listen at work — keeps me on my toes, calculating the time difference. Wonderful listening. Don't change anything please! Im a 28 year old belgian who just moved to Perth and is so happy she found a radio where a combination of her golden oldies is mixed with jazz and classical. Brings me right back to listening to vinyl with my dad! Great job guys! Listened to Curtin - got sick of them, listened to Classic Rock - got sick of them. Just started to listen to your station as of 16Oct15 - not sick of you yet ! Nice and relaxing so far !!!! A young 50 year old who likes Electric Blues but also other good old stuff. Just love the music. Also love that there's not too much talking between each piece. Basically it's music that I, at 65, can relate to. Thank you one and all. I was born in 1980 so pretty much all the music you play is from before I was born but I just love 50's - 70's. My mother corrupted me at a young age and I never recovered. Keep up the good work. I absolutely adore your Station , in Perth it plays in my back garden by The Canning River. I am 29 but capital is the only radio station I listen too, for me a lot of the things you play a practical brand new. Keep up the good work! A newcomer to Capitol - switched from another community station recently & I don't think I'll be changing back anytime soon. Thanks. Saturday and Sunday pm programs are your best. This morning I went out and purchased a DAB+(digital) radio,set it up and am now receiving the great music from Capital Radio with 100% clarity. What a lovely Xmas present! Just want to say : Really enjoy your work, the cheer and entertainment, good company and fun you provide to so many. Plse, be aware that you guys are appreciated so much more than you know! Thanks and ; Keep Up the Good Work ! I am listening to your music and have been for the last couple of hours, what a wonderful selection of music you are playing, truly wonderful. Great to be able to be in Bryne, Norway and listen to 101.7. My permanent station when I am in Perth. Capital Community Radio is the Best station in the whole wide world. Absolutely marvellous stuff !! Please keep it coming. Hello! My name is Vitali and I want to say that I really love your radio. I listen to it every day online, at home and at work. DJs are always positive and they are able to lighten the mood, all rubrics are very interesting. And surely you have great music. It is always a pleasure to be with you on the same wavelength. And I would be very grateful if you send me an autograph from someone of DJs and some souvenir. SO Impressed by the variety of music...but don’t like the churchy music on sunday am...??... love all the presenters...even all their mistookes! I have recently had to leave my husband in full-time care and have been feeling rather lonely after 62 years of married life. My sister-in-law told me to tune into 101.7 and I have been singing ever since! Thank you for keeping me company every day and keeping me constantly amazed and delighted to hear all the music I haven’t heard for years and years. This morning you played ’ Bach Goes to Town’. (Rang and thanked you). Songs from ‘Pyjama Game’ and even ‘Maresiedotes and Doeseadotes’ (? spelling). Can I say too that I really appreciate the old hymns played on Tuesday mornings, some of those I’ve not heard since I was a teenager. Loved Bev Shea this morning. I’ve had a lot to do with Sonshine FM 98.5 but they are catering for a much age than me now, and that’s OK, but I feel that I’m a part of the Capital family. I’ve loved radio since I was about 14, even had an audition with Radio 6PM in their studio in St. George’s Terrace with an announcer named Neville Dawson, but was too star-struck to do much more than stutter! I could say more but you get the drift! Wish I could say more than ‘thank you’. We drove home tonight (Sunday 1st Sep) from Perth to Northam. Really enjoyed the music from about 4.30pm till 6.00pm. Is there any way I can get a list of the material presented? I am a very new listener, as I only discovered this station through changing TV stations and finding West TV, when we were in Perth last weekend. I just love the variety of music that is being played, but it is a shame that I can only receive it with my lap top, when I at home in Albany. Keep up the good work, as it is far better than the crash bang noise that we normally have to put up with on other stations. Hey blokes, I found your station while on hols in Perth over the last couple of weeks. I loved it! Now I am listening to you via the net while I play with my toys in the shed near Darwin in the NT. Keep up the good work, we dont have any similar sort of stations up here. Congratulations on the new website. I enjoy listening to Capital 101/7 exclusively. Thank you for putting music into my life. Well done. Good Morning to you lovely people. Our three sons live in Perth and my husband and I live in Cambridge in New Zealand. We have absolutely nothing like your community radio here in NZ. so we listen to rustycogs from my computer all the time at home. We miss our sons terribly so your radio station helps us feel a little closer to them. We were over in Perth for one of the boy's weddings a few years ago. How can I donate from over here. Do please let me know. My very kind wishes to you all, we just love your programme. Whose business is it, if I choose to read, or play, on the computer,until 4 AM, or sleep until noon? I will dance with myself to those wonderful tunes of the 50, 60 &70's, and if I, at the same time, wish to weep over a lost love, I will. I will walk the beach, in a swim suit that is stretched over a bulging body, and will dive into the waves, with abandon, if I choose to, despite the pitying glances from the jet set. They, too, will get old. I know I am sometimes forgetful. But there again, some of life is just as well forgotten. And, I eventually remember the important things. Sure, over the years, my heart has been broken. How can your heart not break, when you lose a loved one, or when a child suffers, or even when somebody's beloved pet gets hit by a car? But, broken hearts are what give us strength, and understanding, and compassion. A heart never broken, is pristine, and sterile, and will never know the joy of being imperfect. I am so blessed to have lived long enough to have my hair turning gray, and to have my youthful laughs be forever etched into deep grooves on my face. So, I like being old. It has set me free. I like the person I have become. I am not going to live forever, but while I am still here, I will not waste time lamenting what could have been, or worrying about what will be. And I shall eat dessert every single day (if I feel like it). Thanks for your music Capital Community Radio 101.7fm and making my ride enjoyable! A quick message of congratulations on the new website. Clean, easy to navigate, informative and up-to date. 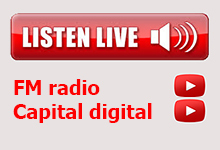 Just wanted to let you know how much I enjoy Capital Radio particularly Kellie Green's show in afternoons. What great music! - Thank you all, especially Bob Webster for his Thursday night programme. Hi, great music, 3.30pm heard in Canberra. Keep it up. Cool website! Great music in some of the programmes, but 40+ is seventies and babyboomers... I wish your music would reflect that a bit more. Keep up the good work! Just fabulous, I listen all day long. Keep it up. Hey, what a great radio station and what a great website to go with it! Great to listen to online.